Will Aznavour’s Concert Be His Last? Charles Aznavour (pictured) is giving more farewell concerts than Anna Russell (bonus points if you know who she is). 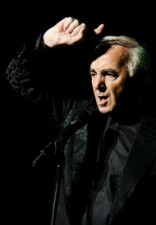 Aznavour is appearing at Madison Square Garden on September 20 and the Garden is promoting it as the French singer’s “truly last” appearance here. Aznavour is 90, but he’s in better shape physically than his younger, biggest American fan: Liza Minnelli. Liza On “Saturday Night Live”?